Coq au vin, contrary to my initial impression, is not “fancy” French food. It actually developed as a way to use the old rooster (the um, coq) in a dish after he was past his prime on the farm. It’s actually an old and rustic dish and much more of a everyday dish than a fancy indulgence. And, unlike the soufflé, it won’t judge you for not being able to speak French or asking directions to the Eiffel Tour. It’s friendly French. While the traditional recipe calls for a rooster, most contemporary ones, including the recipe I used, substitute a chicken. Although, I kept thinking of Tom Colicchico on Top Chef in an episode where he kept saying that Casey had NOT made coq au vin because she used a chicken. Sorry, Tom, but our flyover grocery was out of rooster. Start by cooking your bacon in the bottom of a large, heavy pot or a dutch oven. Remove the bacon after its cooked and put the chicken pieces in. I bought chicken quarters and then broke them down. Tip: Chicken quarters are insanely inexpensive, so if you get comfortable cutting up chicken, you can be very budget savvy. The chicken gets browned and removed and in go your chopped veggies to brown in all that yummy flavor. After the carrots, celery, and garlic are browned the chicken and bacon go back in the pot with the chicken stock, thyme, and dry, red wine. Half a bottle of dry red wine. Cooking with wine....a lot of wine. At this point in the recipe, you can cover the pot and put it in the oven for 30 minutes. BUT- I didn’t do this. 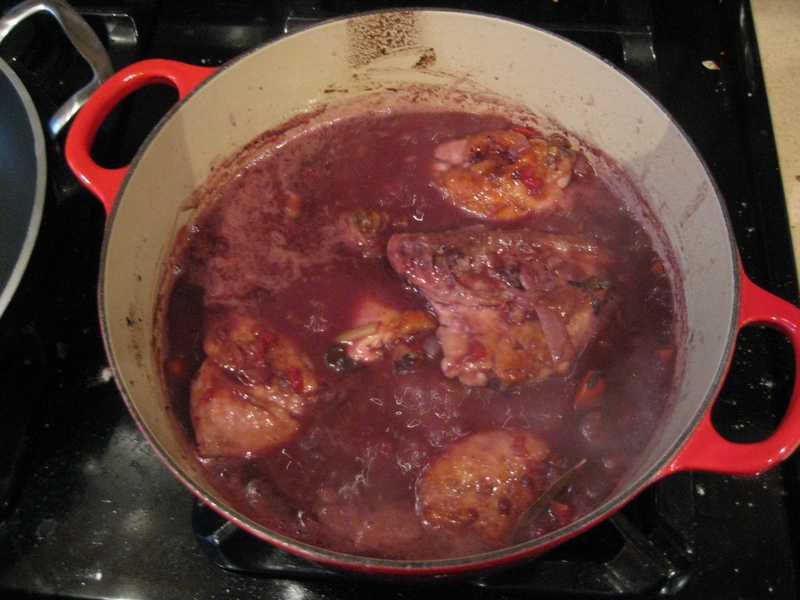 I just let it simmer away on the top of the stove on low heat while the liquid reduced and let the chicken cook in a bath of wine. See? So much more easy going than a soufflé! A bath of wine. Which sounds terribly relaxing. Update 1: List of 30…. 4 recipes done, 26 to go. 1 1/2 pounds of butter used. I know…you’re so impressed. 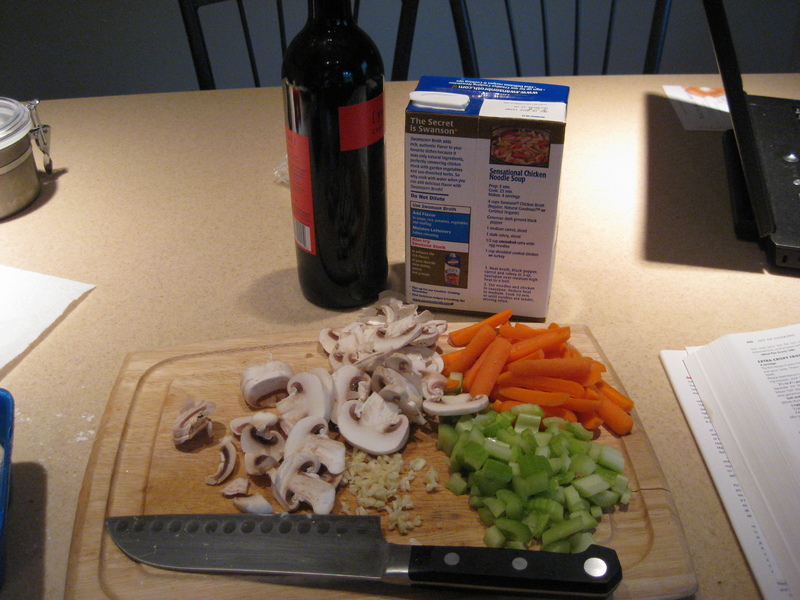 I haven’t been cooking as quickly as I had hoped….time to pick up the pace! My “2 recipes a week” schedule has been derailed by weekends pretending that I could still attend bachelorette parties/weddings and not feel almost 30 the following day. But, don’t worry intrepid eaters, we’ll make it. This will come to a more satisfying conclusion than LOST did. Seriously…so many questions!! 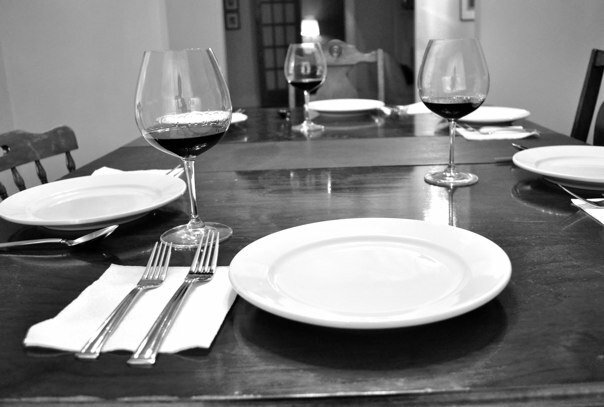 And a friendly notice to our upcoming house guests, local friends, and dinner invitees: start fasting now…you’ve got lots to eat. Also, please buy some more wine. 2. Crown Roast/Standing Rib Roast– going to require its own dinner party! 3. Gravy– I have a recipe chosen and willing participants! 5. Potato Latkes– I’m thinking a weeknight dinner for this one. 6. Hollandaise Sauce Great success! 7. Duck l’Orange– have a friend who’s called “dibs” on this one for dinner. 8. Some kind of Curry A little underwhelming…but great leftovers! 9. Red Velvet Cake– 30th birthday cake?! 10. Real Fried Chicken– mmmmm, anytime sounds good. 11. Salmon on a Plank– perfect for a summer grill out. Who wants in on this one? 12. Homemade Cinnamon Rolls– we have July house guests…so this will be perfect! 14. Lobster– a few friends pitched the idea of a “BYOL” party…which could be interesting. Very interesting. 16. Chicago Style pizza– next week! 17. Molten Chocolate Lava Cakes– no plans yet…anyone want to plan a wine and dessert night? 23. Pea Soup– waiting for a cool spell…it’s been too hot in flyover country! 24. Soufflé– gathered a few recipes, now I just have to work up the courage! 26. Tiramisu– maybe bring this along to book club? 27. Homemade Applesauce So simple. So delicious. So….apple-y. 29. Beef Wellington Blown. Away. 30. Key Lime Pie– making for our 4th of July house guests…lucky them! Set the table....it's time to eat!! So: hit the treadmill…the next few weeks will be full of butter and deliciousness. Thank you to everyone who’s been reading….I’m having more fun than you can imagine! p.s. Hope you are enjoy the long weekend! So next on our list: Beef Wellington. Beef Wellington, like most entrees with surnames in their titles, has a back story. The dish got its name from the Duke of Wellington who earned the honor by sending word of Napoleon’s defeat at Waterloo. The French had created the dish and called it “filet de boef en crote”. The Duke apparently loved it and the English wanted to spite that silly French “emperor”…so the name got changed. So basically Beef Wellington is the original “freedom fries”. I used the recipe from The Joy of Cooking (Scribner, 2006 edition). 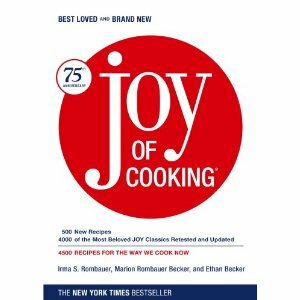 Classic recipe = classic cookbook. 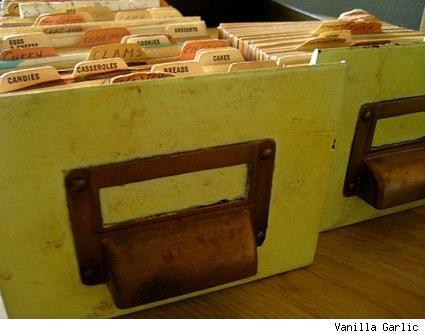 And there is NOTHING more classic than TJOC….in fact, it’s going to require its own post. Stand by. Back to the beef. There are basically four big ingredients: 1. the beef; 2. the puff pastry; 3. the pate or foie gras; 4. something called “duxelles”. I’ve pronouncing this like “duck’s L’s” which I think is pretty close. No doubt the French would still pretend they couldn’t understand me…. First: buying the ingredients. Most recipes call for a fillet of beef. So basically a really big (eg. 3 lbs) filet mignon. Which, I discovered, you have to pre-order and may have required pawning some of my personal belongings. So- I chatted up the butcher at our local grocery store and asked for a substitute…he gave me a well marbled bottom roast tender enough to cook in the oven. A 3 1/2 pound roast was about $13. WIN. Sidenote: I attempted to befriend the men working at the meat counter…I think they may be invaluable to this project. They, in turn, demanded that I report back on the outcome of the Beef Wellington. DEAL. I also had to ask for help finding some sort of liver/pate/foie gras. This deeply concerned the assistant manager….but HUZZAH!! They had it! For future reference: the canned meat section is home to this treasure. Also for future reference, I will try to avoid using the phrase “canned meat”. First, the mysterious “duxelles”. This recipe was also in TJOC. You mince a pint of mushrooms in the food processor and dry them off with a paper towels. Saute them with lots of butter and finely chopped shallots until all the liquid is gone and they have browned. 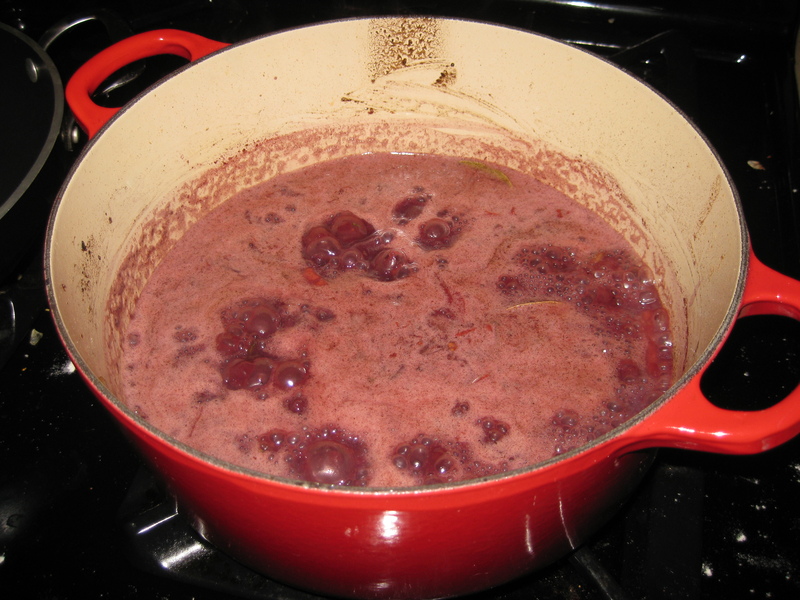 Add 2 tablespoons of Madeira wine…which smells thick and boozy, like an after-Masterpiece-Theater kind of drink, and cook until evaporated. This is duxelles. Cool this mixture. 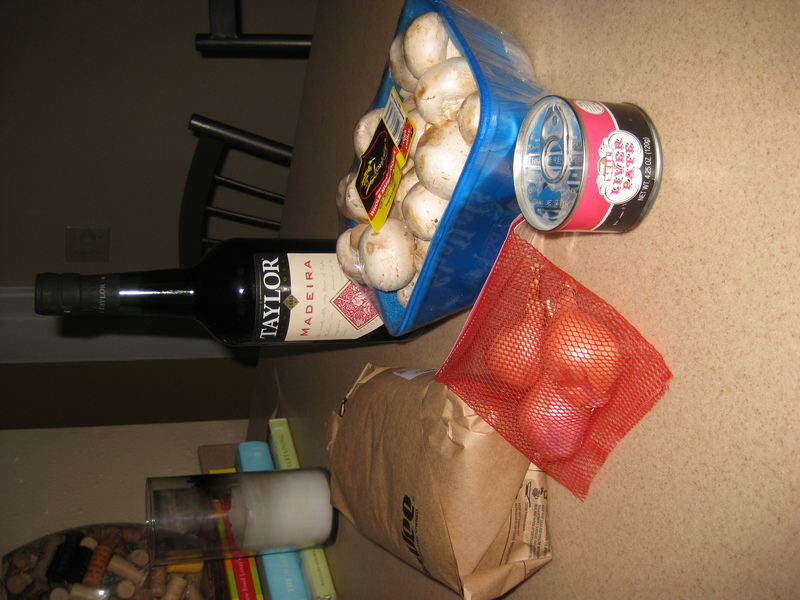 Later mix the duxelles with about 1/2 cup of the pate and a couple tablespoons of Madeira to make a paste. Next, sear your roast on ALL sides just to start the cooking. Then let cool. While this happens get your puff pastry situated so you can wrap your whole roast in it. I needed two sheets rolled together to cover the roast. Sprinkle the counter with flour and don’t over handle the pastry or it will start melting…it’s 1/2 butter. No, I’m not joking. Puff pastry is half butter. So. Amazing. So next you smear the duxelle/pate mixture on the pastry, center the beef on it, and smear the remaining mixture all over the beef. 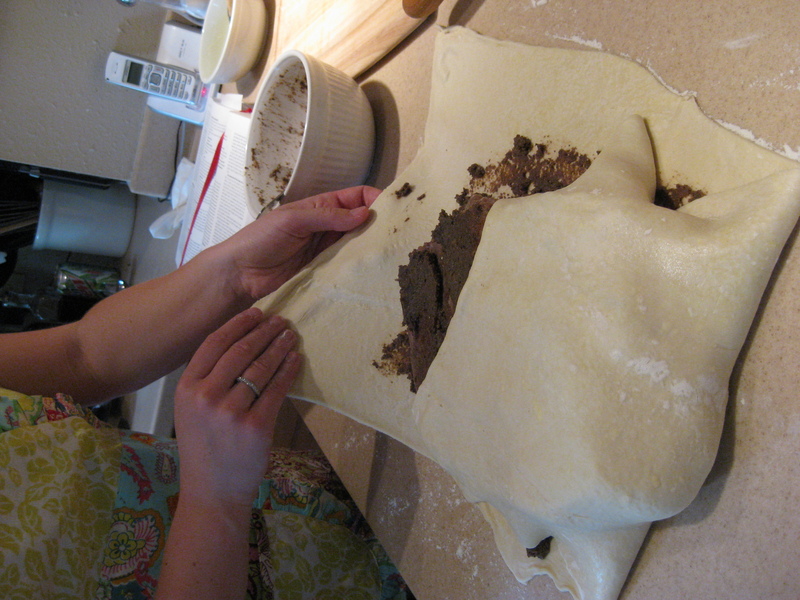 Then, fold the pastry over the beef and seal the edges with an egg wash (egg + a little water + a little milk). Disclaimer: this looks gross. The whole things goes SEALED SIDE DOWN on a greased pan. Cut a few slits to release the steam and to create a place where you can check the temp of the meat. Traditionally, you decorate the top with leftover pastry in the shape of vines and flowers. I attempted two flowers but they looked like the trees in Horton Hears a Who. 350 degrees for about 45 minutes, then start checking with a meat thermometer. 160° is about medium, but keep in mind it will keep cooking post-oven. Pull it out and let rest. I had to use a meat fork and a massive spatula to move it…veeerrry gourmet.